The most primitive of buildings are little more than a roof. If the roof cannot be felt visually around the home it doesn't satisfy the psychological need for shelter. The roof shelters if it embraces, covers and surrounds the process of living. Alexander's advice is to make the entire surface of the roof visible, bring the eaves low to about 6’6” (2m) where people gather, like entrances and seats and build the top storey of the building right into the roof. 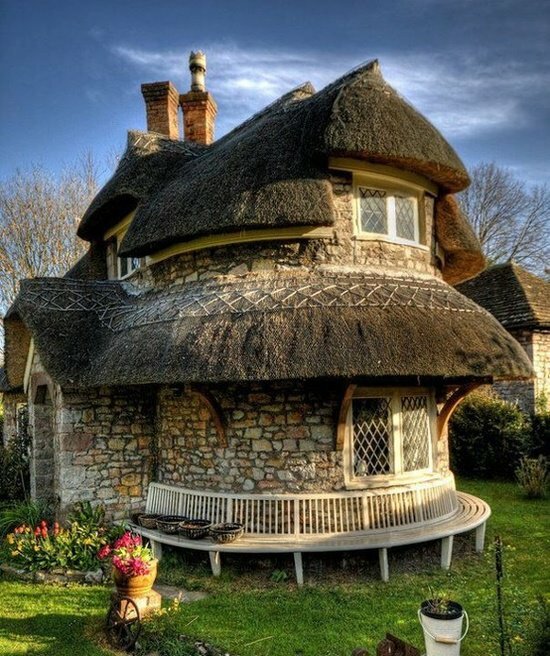 This beautiful home is a rubble stone lime mortar thatched cottage in Blaise Hamlet near Bristol, England. It was designed by John Nash, a master of the picturesque architectural style and designer of a very famous house in London, namely Buckingham Palace. The cottage, along with the rest of the hamlet, is owned by the UK's National Trust.